A partnership between the Prince Edward Island Public Archives, Government Services Library, and Legislative Assembly and the University of Prince Edward Island's Robertson Library has brought about the digitization and posting online of legislature documents from March 1894 (the beginning of the modern legislature) through 2011. The Prince Edward Island Legislative Documents Online archive also includes images, sound recordings, and biographies of former legislature members. Obviously, this is a great resource if you had relatives who served in the legislature. 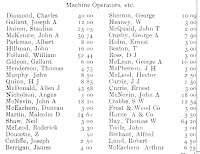 But there are also gems such as the list of machine operators and others who were paid by the Department of Public Works (and the amounts they were paid) during the fiscal period of September 30, 1911 to December 31, 1912, on page 90 of a report by that department. The names include Charles Diamond, Joseph A. Gallant, William Folland, Gallant Gideon, Ernest Currie, and S. W. Crabbe (see the image above). 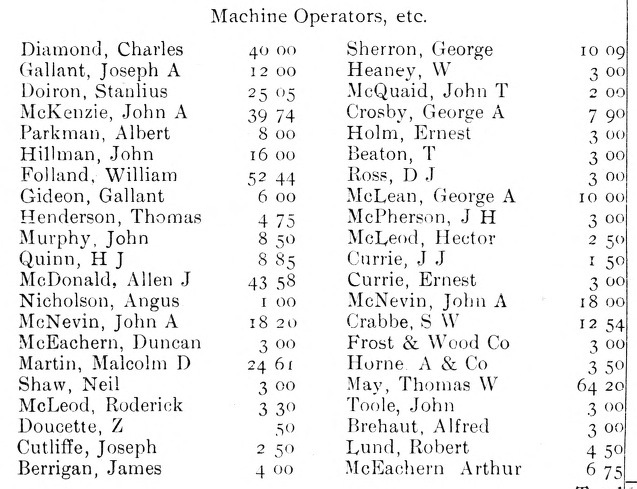 So if you had any relatives who lived in Prince Edward Island, search for their names and see what you find. Judging from the text displayed in the "snippet" results (e.g., "Gontin ued"), it appears that the records were digitized using optical character recognition (OCR) software, which means letters can be misread if the original document was not in perfect condition. A report about the online archive mentions that some of the materials were extremely fragile. If you don't find someone you think should be there, you may need to use creative search techniques.